In 3 days, I'll be on my way to Supai, Arizona, a tiny Indian Reservation town nestled 8 miles deep into the grand canyon that is accessible only by foot or helicopter. 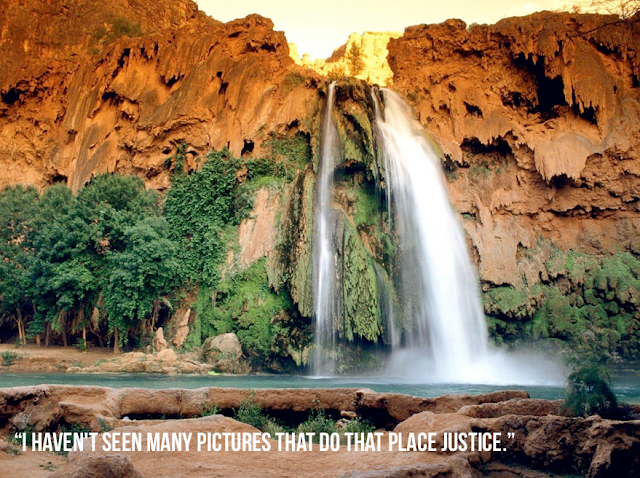 I plan to spend most of my time in and around Havasu Creek, a tributary to the Colorado River which boasts a handful of majestic, breathtaking, awe-inspiring waterfalls. The water from these falls is an incredible tropical blue-green shade due to the limestone at the top of the Havasu Canyon. If this place looks anything close to the pictures I've seen, I'll be a happy camper but from some accounts I've read, most pictures don't do it justice. What?!?! I'm so excited to give you a full account through both words and photos when I return. Ah! We are going in Sept! Jason has been 3 or 4 times before, but it will be my first time. So excited! Have fun & I can't wait to hear (read) all about it & see your pics.